We’re in the midst of Viadoom over here in Seattle – a.k.a. Viapocalypse, a.k.a. Vimageddon, a.k.a. the Seattle Squeeze. There are probably other dreadful names for it, but, basically, one of the major routes through the city, a two-level raised highway called the Viaduct, is being closed down and destroyed. It closed last Friday, January 11, and they are hoping the replacement tunnel will reopen by the end of January. We will see. What does this have to do with cooking you ask? Is this just a non-compelling sidebar? Am I about to start whining about traffic? Well well well. It will all tie in, just you wait. The city of Seattle was generally freaking out about Viadoom, with all sorts of people predicting apocalyptic traffic and misery. The powers that be begged and pleaded with Seattle commuters to find alternate modes of transportation for the duration of the closure. I heard the West Seattle water taxi is at thrice the ridership of the same time last year. Pretty amazing. My kids take rock climbing classes on Wednesday afternoons, and this is the one time during the week that we really need the car; otherwise, we mostly walk everywhere. My husband bike commutes. We own a cargo bike but I’m not very brave with biking in traffic, so it doesn’t get a whole lot of use, especially when it is raining and cold (ow, hands). But on Wednesday afternoons, we drive to the climbing gym. And then we have to drive home. For much of the last three months, that drive home has been the absolute bane of my existence. What should take maybe 20 minutes ends up taking nearly an hour, we struggle in the door cantankerous and hungry, and I have to whip up some kind of miraculously healthy, balanced, and appealing dinner in a very slim window when all I want to do is collapse in a heap from the unpleasantness of driving in traffic (and usually rain) for nearly an hour. This week? With Viadoom? I was on it. I was imagining the traffic was going to mean a who-knows-how-long ride home. Would it be an hour? Two? Would I need to pull over and get the kids changed into pajamas so I could carry them into bed, the clock ticking by the endlessly passing evening? I packed extra nutritious and sizeable snacks. AND? I made dinner. At 10AM. Of course, it ended up being the fastest drive home we’ve ever had. Out the climbing gym door at 4:35 and through our apartment’s door 14 minutes later. Zero traffic. I think Seattle is indeed legit terrified of Viadoom and everyone is in hibernation. It’s working! Can we just all keep living our lives like this? It’s so civilized. But despite the fact it was in the end unnecessary, it was still immensely satisfying to be able to walk in the door to dinner, prepared. I even had time to make a quite tasty seedy slaw to go with it. What is the 10AM dinner miracle? 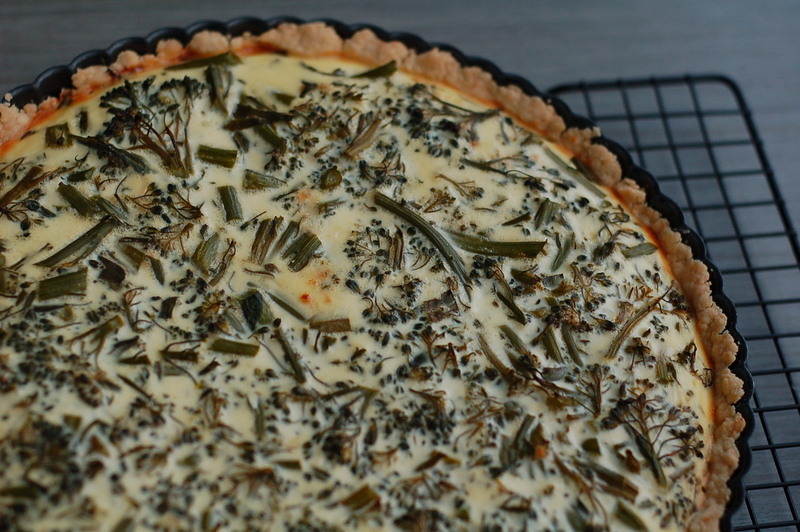 There are two parts to this recipe: (1) the pie crust, which is so easy to pull together that may it forever remove any temptation to buy a pre-made crust at the shop, and (2) the quiche formula, which is so quick and so surprisingly healthy for what ends up being a pretty lush meal. The first part – the pie crust – is based off a recipe for no-roll pie crust from King Arthur’s flour; I changed it up to add in the sourdough starter. If you don’t have a starter, make one, or just go to the King Arthur recipe and use that. 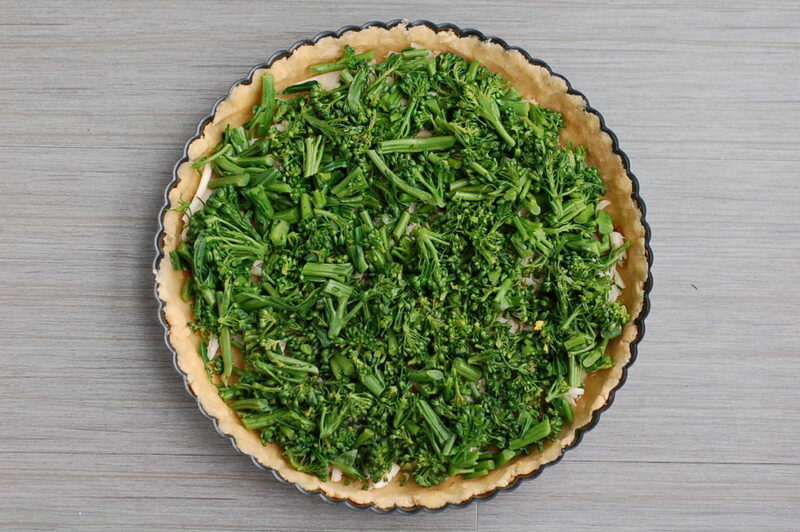 The quiche formula comes, with some minor adjustments, from the eternally wonderful Mollie Katzen and her classic The Enchanted Broccoli Forest. I’ve always been partial to Mollie because she is one of the rare folks amongst us who spells her name correctly. High five, Mollie, high five. The pie dough requires no special handling, no chilling, no rolling, and no pre-baking before filling. It is also, incidentally, vegan. I’ve never tried it with a sweet filling, because I usually make it with olive oil, and I’m not sure that would work. But you could up the sugar a tad, use melted butter or some other more neutral tasting oil (or maybe coconut oil? I don’t really like coconut oil, so I rarely keep it around) and I bet it would work a treat. 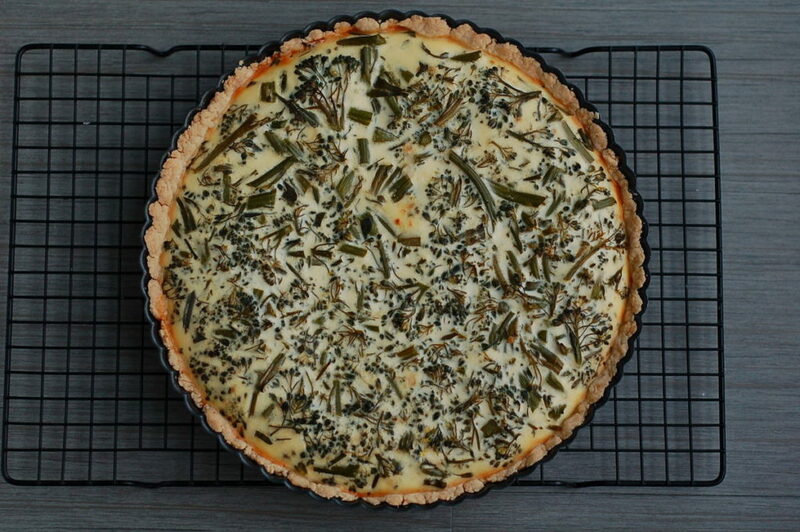 With the olive oil, though, it’s a joy as a crumbly, rich quiche shell. It’s important to use a good quality oil, as the flavor ends up being assertive. Look at that lovely, unbaked, so little effort pie crust. You could absolutely make a billion changes to the filling: use a different vegetable! Use a different cheese! Skip the mustard! Use buttermilk instead of yogurt! Heck, use milk instead of yogurt! This is a favorite around here because broccolini is so easy to prep and so delicious and so green. I like the protein contribution from Greek yogurt, and we always have some on hand. I’ve made this with my own less thick homemade yogurt, and that works well too. Any kind of thickish dairy product would really work fine. Combine the flour, salt, sugar, and baking powder in a large bowl and whisk to combine. I like to use my dough whisk for the whole mixing process, but a regular whisk would work fine. In a separate bowl, combine the oil and starter. Whisk to combine. Pour the combined oil and starter into the flour mixture and stir to combine. 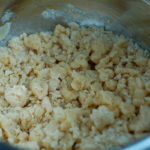 This will not come together in a smooth dough, more like a crumbly mixture. 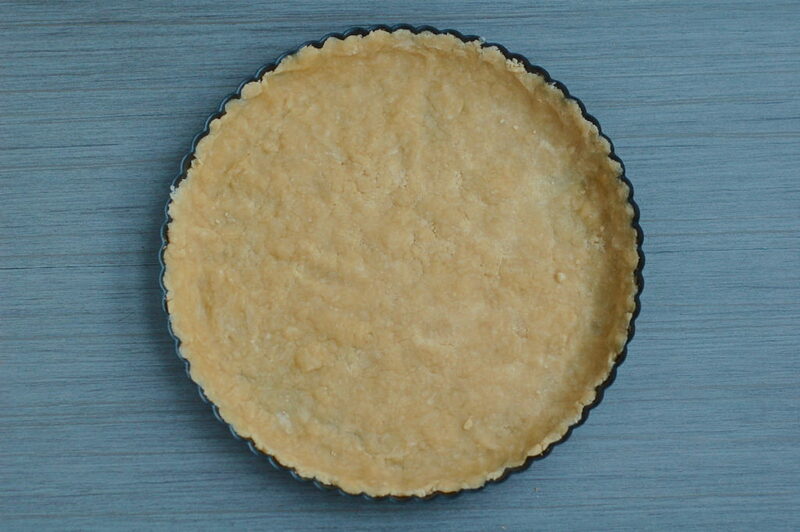 Spread the mixture into a standard 9-inch pie plate, quiche dish, or tart pan. Using your hands, press the mixture flat, covering the bottom of the dish and up the sides. Be firm and try to get it as even as possible to ensure even baking. If you like, spread 1 tsp of good quality mustard (I like to use dijon because it spreads easily, but a grainy mustard is also very good) over the bottom of the pie crust. Set aside while you prepare the filling. If you haven’t yet steamed your chopped broccolini, do so now, just for a minute or two. You don’t want it to get mushy! Grate your cheese of choice as well. I like to use a sharp cheddarish type, like Beecher’s Flagship, but almost any cheese would work well – feta, gruyere, comte, parmesan: whatever you have in the fridge. In a bowl, whisk together the eggs and yogurt until it is completely smooth. Add a pinch of salt and a splash of heavy cream if you have it, and whisk again, thoroughly. Assembly time! Spread the grated cheese evenly over the bottom of your prepared crust. Spread the steamed broccolini as evenly as possible over the cheese. Pour your custard filling over the broccolini, trying to cover most of the pie plate. You may need to pick up the pan and use gravity to help fill in the gaps. Use your hands to help tuck any rogue bits of broccolini under the custard. It won’t be totally covered, but you don’t want huge chunks sticking up. Bake for 35-40 minutes. It should be set when you remove it from the oven. Allow to cool for at least 10-15 minutes before cutting in; this is great warm or at room temperature.